We most recently had the honor and challenge of pulling of a beautiful, earth day inspired wedding in less than 6 weeks. When the first email came through, our bride, Isabel, sounded hopeless. Like no one could pull off a wedding in such a short amount of time. I said huh? Us? We strive under pressure and tight timelines. I said Bring.It.On. Venue: The big popular venues book up months, even years in advance. However there are always options as long as you're willing to be flexible. 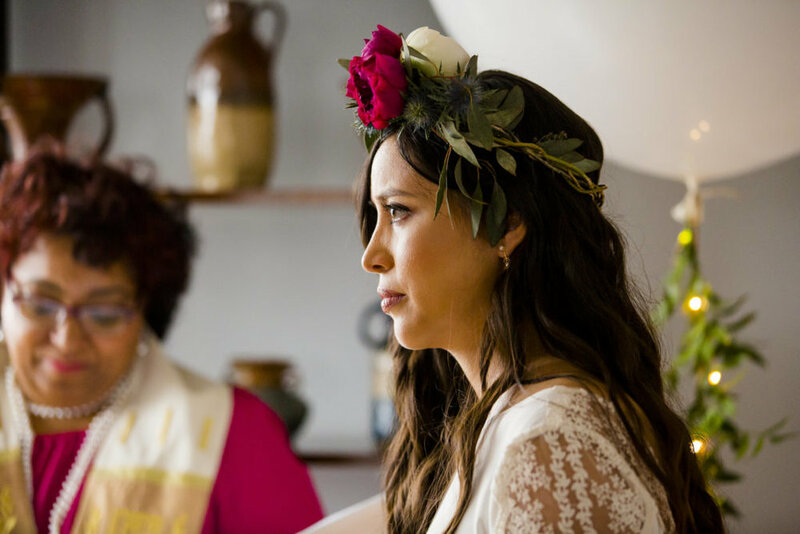 Isabel was lucky enough to be able to hold her wedding in her fiancé's parent's apartment. We made the space work by setting up chairs that we rented for the ceremony, set up a satellite bar for cocktail hour in the hallway (one neighbor, and she was cool with it!) and flipped the room for dinner. Officiant: Isabel had this all lined up with a best friend who prepared a beautiful ceremony led with passion and love. Marriage license: You will need to have this arranged ASAP to have in time for your ceremony. You can find all the details and paperwork to apply with a simple search online. Attire:The best site for last minute, quality, well priced wedding dresses is BHLDN. They offer a huge variety of styles in the latest fashions and are ready to ship so you can receive quickly and with enough time to take to your local seamstress to alter if necessary. Isabel was on this and already had her dress when she got in touch. Photographer: The most important vendor at your wedding. We booked Dave Robbins Photography for Isabel's wedding and she told us after receiving the photos, it was the best decision she made. 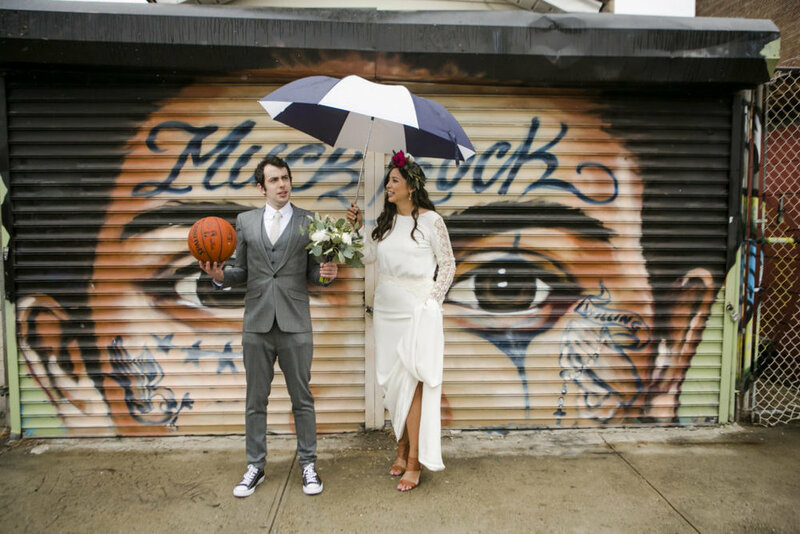 Look & Feel of the wedding: The wedding date was set for April 22nd, Earth Day. Isabel wanted decor to give an eco-feel to her party with tons of lush greenery and pops of fuchsia. She had inspiration photos for us to review including a photo of a stunning flower crown that she wanted us to make for her to wear for the day. 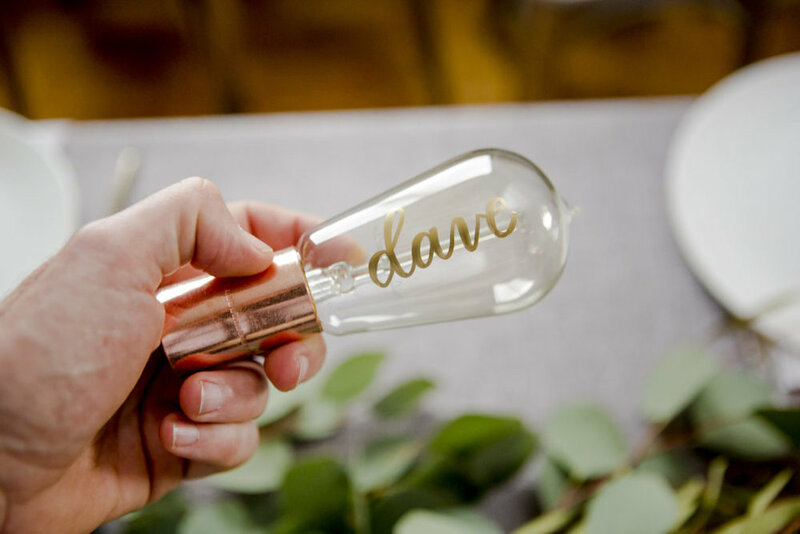 The team over at Paperfinger took care of sourcing these brooklyn light bulbs for our table cards and wrote in stunning calligraphy, the name of each guest. For the menu, we used recycled sparkling water bottles and affixed the menu. Hair & Make up: For wedding beauty we love to refer our clients to Beautini. They show up with a team of artists who work their magic and leave you looking gorgeous and ready for photos. Food: Fresh, seasonal ingredients are a little last minute themselves. So the food is the easy part. Check out your local caterer, tell them what you love, or leave it to them. We love Poppy's Catering for their creative, delicious, gorgeous meal for Isabel's wedding. They also baked a cake to perfection. We decorated the simple, buttercream frosting with greenery and Isabel placed it with a meaningful cake topper. Flowers: Flowers can add up quickly at a wedding. If you're on a budget you can find flowers at your local farmer’s market or flower shop and if you tell them they are for your wedding the vendor should be willing to negotiate. Use household items such as recycled wine bottles, glass jars or pretty water glasses as vases. Prep the flowers the night before and keep them in a cool, dark spot until you are ready to use them. For Isabel's wedding we arranged a huge runner of greens and fuchsia peonies to line the dinner tables. It was a dramatic look but low enough that everyone could see the person they were sitting across from. Guest Book: It's so nice to have something when it's all said and done, to remember your wedding day. Of course, the photos are #1. But we love coming up with a creative way to have a guest book. For Isabel's wedding we took a page from my Sister's wedding and set up a Jenga game with markers so each guest could sign a block. After the wedding and for years to follow, Isabel & Sean will always be able to look back at their guest's notes and remember their special day.